Hardy Oil and Gas, the oil and gas exploration and production company with assets in India and Nigeria declares the spudding of its first exploration well KGV-D3-A1 on the KG-DWN-2003/1 (D3) exploration license on the East coast Krishna-Godavari deepwater basin in India, and the successful well test on the Company's Oza field in Nigeria. 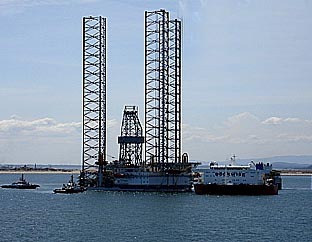 The exploratory well KGV-D3-A1 was spudded at a water depth of 720 meters with the semi-submersible drilling rig "C Kirk Rhein" on Dec.28 2007. The well is targeted to drill to 2,959m MDRT to explore hydrocarbon prospectivity within the Pleistocene and Miocene formations. The Pleistocene target is a deepwater fan complex and the Miocene target is an unconformity trap. Hardy, through its wholly owned subsidiary Hardy Exploration & Production (India) Inc., holds a 10% participating interest (PI) in the D3 exploration license. Reliance Industries Limited is the operator and holds a 90% PI in the block. The D3 exploration license is in phase one which provides for the drilling of six exploration wells. Hardy also declared the completion of a successful well test on its Oza field in Nigeria. The well test comprised the running of multi rate tests, a gradient survey, and collecting PVT samples. The flow rates averaged 606bbls/d with an average GOR of 5,466scf/stb. The Oza joint venture will utilize the results of the well test for the planning of future field development activities. The test was carried out by Millenium Oil and Gas Company Limited, operator of the Oza field. Hardy, through its wholly owned subsidiary Hardy Oil Nigeria Limited, holds a 40% working interest in the Oza field and is the designated technical partner. The Oza field is located in OML 11 onshore block, about 35km northeast of the city of Port Harcourt in Abia State, Nigeria.